When Loren Pope learned of the acclaimed architect Frank Lloyd Wright, he spent months working up the courage to mail him a letter. "There are certain things a man wants during life, and, of life," Pope divulged in 1941. "Material things and things of the spirit. The writer has one fervent wish that includes both. It is for a house created by you." Wright penned in response, "Of course I'm ready to give you a house." Their earnest collaboration resulted in a humbly exquisite Falls Church home. Pope's wish had come true, but mere wishful thinking would not be enough to save the house from highway builders in the 1960s. Thanks to Samantha Bass and Zachary Paul Levine of the Jewish Historical Society of Greater Washington for the guest post! As many realtors will tell you, the first three rules of real estate are, “location, location, location.” Well, in the late 1960s, location presented a very serious problem for transit planners and the congregation of the Adas Israel synagogue. 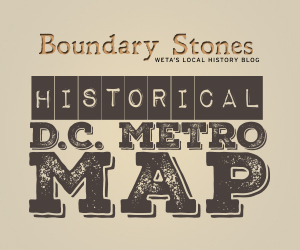 Construction of Metro’s Red Line was getting underway and WMATA had acquired the block bounded by 5th, 6th, F and G Streets, NW to serve as a staging area and, eventually, the home of Metro’s headquarters. There was only one problem. The block was also the home of Washington’s first synagogue building, which had been standing on the site since 1876.